One of my favorite childhood traditions was the scavenger hunt for gifts. Sometimes for birthdays and often for Christmas, my parents would create clues that would lead me to my gift. My husband knew this and began the tradition amongst ourselves early in our marriage. Now that our kids are older we’re planning to begin the tradition with them. I’m so excited to share these Christmas Scavenger Hunt clues so you can start your own tradition at your home! Most of these clues were created for me, so some might be a little tough for kids. However you can either help them or come up with your own. The trick is finding some rhyming words for where you want to hide the clue, then go from there. We like to buy some cute Christmas envelopes to hold the clues. If you have more than one child, you could pick an envelope style for each kid. You can either place clue #1 on the tree, or wrap it in a gift as we do. That’s my favorite way to start a Christmas Scavenger Hunt because it’s unexpected! You have to walk through the clue placement carefully. As you start with clue #1, that clue directs you to one room/area, then the clue you place in that room directs you to another room/area. You can choose to use as many clues as you want, but don’t forget to put the gift wherever your last clue is directing them. This always takes a bit of juggling in the morning because you have to make sure the person/kid won’t see the clue before the gift opening begins! 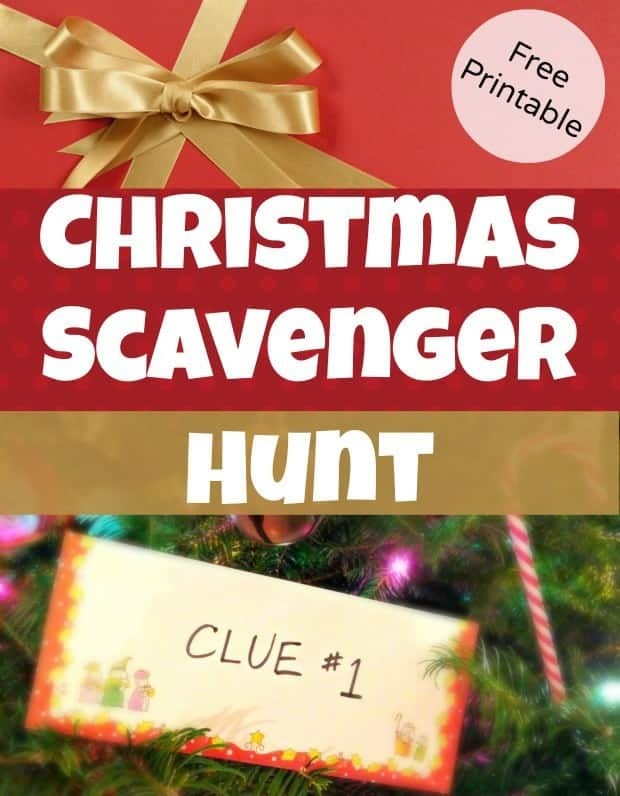 I’ve included 9 premade rhyming Christmas Scavenger Hunt clues and 3 blank clues for you to create your own. I’d love to know if you plan to do a Christmas Scavenger Hunt this year! Let me know if you have any questions about the clues. I’d love if you like my Facebook page (quick click below) as a Thank You if you plan to use the clues! Thanks! And now even more Christmas Scavenger Hunt clues for family fun! Such a cute idea! I love that you had this tradition in your family and that your husband carried it on for you. That is such a loving gesture. I don’t have any kiddos yet, but this would be so much fun to do with little ones. Thanks for stopping by Stevie! It really is such fun, and can help prolong the “excitement” of opening a big or special gift! What a fun tradition! We never did this in our house growing up, but I know my boys would love it. Thanks for the printable – so helpful! Glad you like it! Hope it works for your boys! I LOVE this Marg! What a great way to surprise your love and put some fun in our everyday lives. Thanks for sharing! Hi Deonna! Thanks for stopping by — I’ve linked up at your party! This is such a great idea! I think I will try it with my son this year! I love surprises and challenges and I am planning a scavenger hunt for my nieces and nephews for Christmas at grandma’s. i was delighted to find your link. thank you for sharing…. It is very helpful to get the clue ideas rolling!! And I like the envelope suggestion to coordinate with different kids. Thanks!! So glad you like it Renee! Good luck with the scavenger hunt, I’m sure they’ll love it! Love this idea! I will be using it this year for my kids, nieces and nephews at our family Christmas party!! Thanks so much! You’re welcome Nichole. Hope you have a great party! This is fantastic! It is my first Christmas having my husbands parents here and I am nervous/excited! I have been trying to find creative ways to make this year magical! (I do every year but this year involves a few more people) We are giving them a cruise and were planning on using little hints, like sunglasses, beach towel, toy boat etc to lead up to it, but, I love this scavenger hunt idea! Maybe hide the small gifts with the hint? I will definitely use this for the kids though! We will have all 5 this Christmas as well and this will make Christmas morning last so much longer than just tearing into everything! My kids (teens now) love opening their stockings before we parents are up. Each year they get up early and then wake the other one up. Last year we decided to hide their stockings and do a scavenger hunt. We made clues and bought the fake coal candy. We lead them from the where the stockings were supposed to be to the kitchen, bathroom, dryer and finally to the stove where their stockings were. The best part of it was they were trying to be quiet and not wake us up – so they were hunting in the dark and the quieter they tried to be the more giggly they became. My husband and I enjoyed laying in bed and listening to them bump around, laugh and try to whisper to each other. Christy, love that story! What fun! As my kids get older and the years go by faster, I realize that I want to create as many family memories and moments as possible. Thanks for sharing! We have been doing this with our older kids since they stopped believing in Santa. Makes for a fun Christmas morning! That’s wonderful Ginger! It’s nice to still be able to have a bit of “magic” to Christmas morning even when we get older! I just love your page. Would you mind if I feature some of your DIY’s on my blog? I will of course link your site and attribute you for the assistance. Hi Dana – thanks so much! I love for people to share my projects with their readers, I only ask that they not use more than a 50 word synopsis (you cannot republish the post) and that you only use one image giving credit to my site on the image caption and with project information. Happy to have you following along! they will love, and start their own traditions. Thank you very much! Thank you – scavenger hunts are great family fun traditions! Great to hear Sarah! I have a fun new one that I’m working on for posting this year, it’s just taking me forever to get around to doing it! HA! Hope your kid(s) enjoy the hunt and that it does become a fun tradition!